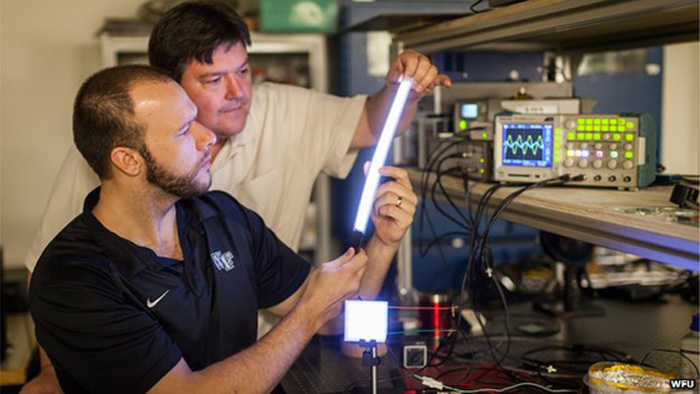 Scientists in Wake Forest University in North Carolina have developed an alternative to fluorescent lighting using polymers. Professor Dr David Carroll and his team have created a light source from passing electricity through white polymers that contain a small amount of nanomaterials which glow with the electric current. The light produced can be manipulated to replicate the solar light from the sun. This is a far better/nicer light than the bluish light given off by the fluorescent equivalent. I think the most interesting aspect of this discovery is that because the light bulb is essentially plastic the light source can be made into any shape! This could have some really interesting architectural applications.